I've been keeping up with the yarn as it has arrived for the tasting. The yarns from The Unique Sheep and RedFish are ready. I'm doing Classic Elite this week. They sent two yarns for the tasting--Soft Linen and Firefly. We are doing to do some promotional photos at the next photo shoot. Most of the yarn will arrive after TNNA. Speaking of which, I will not make a blog entry next week as I will be leaving for TNNA which is in Indianapolis this year. Again, a reminder...if you want a hard copy of the lesson, please let me know in the lesson you have sent for review. Otherwise, I will email the lesson to you. Also, I will be out of town Friday-Sunday of next week so if you send a lesson in, I won't be able to review it until Monday. Anyone who has worked with cables has probably had the experience of messing up a cable. I do this all the time. I wish I didn't. I did a sweater for Cast On a number of years ago and I didn't notice until the photo shoot that I had a cable slanting left when it should have slanted right. OOPS! Luckily it was at the armhole. If I had just stood back and looked at the piece I would have noticed it. One of my New Years resolutions is to look at each pattern row as I finish it. It is much easier to fix mistakes at that point. It isn't difficult to fix a cable. It is just messy. If you have a low tolerance for this sort of thing, rip out your work. As with fixing dropped stitches in stockinette, sometimes the tension gets screwy. Tension at the left side of cables can be a problem as it is and if you fix the cable, it can be worse. (Remember, you can avoid those ugly ladders to the left of cables by bringing the yarn forward tightly when transitioning from a knit to a purl. Here is a photo of a cable problem. To fix this, work up to the cable and then undo the problem stitches until you reach the cable. I put the cable stitches on cable hooks. The video shows the process of fixing it. Fixing a cable Again, this can be a frustrating experience as the video demonstrates. Some knitters find it easier to just rip out all of the work to the problem site. I generally try fixing it first and if it doesn't look right, I then rip it out. Here is the fixed cable. 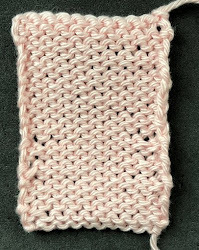 I was surprised that the tension seemed OK. After all of the yarn manipulation required, I thought it would look awful. The Met is broadcasting Cosi fan tutte is on Saturday. Only one more opera after this one. I will be in Mozart overload as I am working on a Mozart piece for the piano which has been a dream to play (after Bach's Italian Concerto everything seems easier!) Salon will be on Sunday from 2-5pm. I finished up the Boyfriend Scarf & Slouch Hat. I love how they turned out. The yarn was heavenly to work with--Juniper Moon Herriot. I wanted the hat to be VERY simple, both in its appearance and in difficulty rating. There is a K2P2 band which transitions into K1P1. It definitely is a "One Size Fits All" hat. I did lots of videos for it to help the "Confident Beginner." The patterns will be in the Fall issue..just in time for holiday knitting. The scarf and hat were the last of the garments for Cast On. I am working on a pair of birthday socks. I love the yarn. It is 10% bison down and merino from Alisha Goes Around. I've used it before and will definitely use it again. The pattern is one I did for Cast On last year--Baby Bees.